Really Good Reads: Michael is "Right"
This is a book Christian parents in Canada should give to any of their college-bound kids, before they head off to campus. 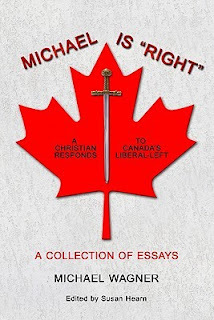 In the interests of full disclosure I should note that Michael Wagner is a regular contributor to Reformed Perspective, the magazine I edit (and Michael Is "Right" was published by Marnick Press which is owned by Martin VanWoudenberg who has also written for RP!). About 100 of the 180 pages are articles that were first published in RP, with most of the rest from other publications, and a few written just for this book. But the very same reason I keep publishing Mike is the very same reason I'm recommending his book - he writes well, about things that matter. His particular specialty is introducing readers to secular professors, writers and scientists - people with little regard for God - but whose research backs up the Bible. He also highlights pivotal secular types who have directly attacked the Bible, and then goes on to explain the faults in their logic. So while this title would make a great gift for almost anyone, it is an absolute must-read for any high school graduate heading off to university. For them it would serve as an effective vaccination against the odd, and perverse ideas they will be exposed to on campus.